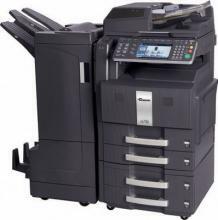 With over 50 years combined experience, Art Beane, III and Charlestowne Digital provide factory authorized expert service on Kyocera and Copystar copiers, fax machines, and printers. Many Kyocera owners in the Charleston area will remember us from when we used to service your Kyocera Mita copiers in the 1980's and 1990's when we were DW Duplicating. If you long for the days of excellent customer service and having your equipment dealer work hard for your business, contact us. Our service contracts can be custom designed to meet your companies unique needs. If your current Kyocera or Copystar service provider is not providing you with supplies or the service you expect, contact Art Beane for personal, same day service from a locally owned company. We stock all Kyocera and Copystar parts and supplies in our Charleston office to provide you with same day availability of these crucial items. Stop waiting weeks to receive the toners you need to keep your office equipment operational. Please call if you would like us to give you a quotation on a service contract. We will match or beat your current service rates and provide the quality of service you expect from a Copystar and Kyocera authorized dealer. If you don't own a Kyocera or Copystar currently and would like to upgrade to one of our systems, we offer trade-in allowances to help offset the cost of upgrading to our award winning products.